It’s curtains up on a delightful new production from Steve Light, whose intricate pen-and-ink style sets the stage for a romantic gesture gone comically awry. Lazlo is in love. He selects the perfect red rose and sets off to the theater to present it to his beloved, an actress currently starring in Alice in Wonderland. When a naughty cat snatches the flower, Lazlo gives chase. Through the stage door, round and round backstage, through the orchestra pit they go, wreaking havoc along the way. Readers are treated to an array of delightful characters from Lewis Carroll’s classic, along with an insider’s view of the workings of a majestic theater. An author's note describes the numerous superstitions related to theater that appear in the book, and invites readers to spot them. Steve Light is the author-illustrator of The Christmas Giant, Zephyr Takes Flight, Have You Seen My Dragon?, Have You Seen My Monster?, and Swap! He lives in New York City. Featuring a racially diverse cast of characters and an interracial romance, this charming picture book acquaints (or reacquaints) readers with the elements of Lewis Carroll's classic while also taking them on a delightfully zany theatrical romp that only someone in love could inspire. 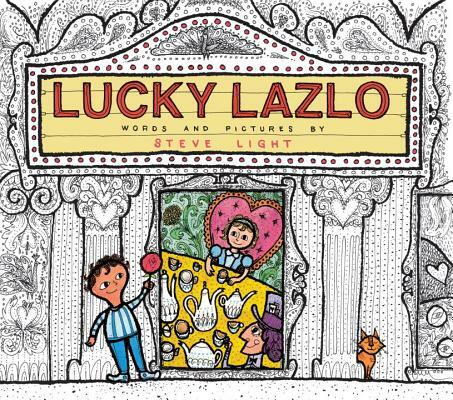 The title indicates that Lazlo is lucky, but readers of this delightful book will undoubtedly feel that they are really the lucky ones. Light’s delightfully detailed pen-and-ink illustrations use focused areas of color to stand out against his signature black-and-white backdrops. Each spread is a visual feast that references both the world of the stage and Lewis Carroll’s beloved Wonderland characters...this title will appeal to children interested in the theater and the many strange and fascinating beliefs of those who tread the boards. The elaborate costumes, scenes, props, and overall theatrical setting of the story are tailor-made for the thick, black line-work and intricate detailing that Light's (The Bunny Burrow Buyer's Book) fans will recognize from his previous books...Despite all of the disruptions, Lazlo's love errand is a success, calling to mind another theatrical expression: all's well that ends well. This is a wild ride that kids will enjoy. What will not be as clear to little ones is that the story is also full of theater lore and superstitions, enumerated on the last page. Adult readers will enjoy that. It’s sheer fun in many directions, but it’s especially entertaining for theatre-lovers of all ages.